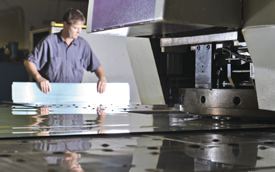 Often, the machines that metal fabricators employ to turn sheet into cut, formed and assembled products are only as good as the tools they’re outfitted with. Such is the case at Kelly Fabricators, Louisville, KY, where management at the vertically integrated contract manufacturer never loses sight of the value returned from investing not only in state-of-the-art fabricating equipment, but in the latest tooling as well. It’s fully aware of what’s needed to satisfy customer requirements for ever tightening requirements on lead times and quality. Two years ago the firm added a new CNC turret punch press to its 60,000-sq.-ft. shop—a Murata Machinery Vectrum 3046 Alpha model—to increase capacity and fuel its growth. A servo-hydraulic 30-ton-capacity model, the press is a twin to another Vectrum 3046 running in the shop. The machines fabricate 22-gauge to ¼-in. aluminum-alloy and carbon- and stainless-steel sheet for customers in the lighting, packaging and retail-store fixture markets, to name a few. Only difference: Kelly’s original Vectrum boasts 44 tool stations as well as an automated sheet loader/unloader, while the new model holds 54 tools. A Kelly Fabricators tends to tooling while overseeing one of the two CNC turret punch presses the firm operates. The presses fabricate 22-gauge to ¼-in. aluminum-alloy and carbon- and stainless-steel sheet. Part separating took a significant turn for the good four years ago when the firm invested in a new slitting tool for its CNC turret press—the Rolling Pincher, part of the Wilson Wheel family of products from Wilson Tool, White Bear Lake, MN. Adds Tony Deye: “The wheel gives us flexibility to meet shrinking lead time requirements from our customers. It fits our lean-manufacturing strategy to eliminate waste from our processes, and to find s to do more with our existing equipment. And, the wheel gives us great repetitive accuracy.” Wilson Tool rates the Rolling Pincher for slitting stainless steel 0.8 to 1.5 mm, mild steel from 0.8 to 2.0 mm, and aluminum from 0.8 to 2.5 mm, with a minimum radius of 500 mm. An added benefit of scoring and snapping parts out rather than shearing to separate parts has been improved material utilization, say the Deye brothers. “This has been particularly important when fabricating highly polished aluminum sheet for our lighting customers,” says Tony. Removing a shear from its equipment lineup also paid dividends for the company (one shear remains, to handle thicker material). “By red-tagging a shear, we cleared floor space and were able to rearrange our equipment to optimize work flow,” says Tony. Many of the parts fabricated on the turret presses flow to press brakes for forming, and then on to assembly operations. Fabricators considering using the Wilson Rolling Pincher slitting tool might find these tips, provided by Murata Machinery, of interest. • The CNC turret-press operator must recognize the orientation of the wheel when loading it into an auto-index station. Programming is based on this orientation, and improper setup can cause the wheel to run sides, damaging the wheel. Unless the station or holder restricts the direction of installation, load the tool at 0 deg so that it can run in the plus or minus direction. • The dies must be free to compress downward. If used in an auto-index station where the retaining ring holds the die on the upper portion, it should not be tightened down on the die. The upper portion of the die must be able to compress downwards to expose the tool for cutting. • Remove the wheel from the turret after each program, if it is not to be used again. Leaving a wheel in an auto-index station can damage the wheel. • Als start the wheel on the material, never off the edge of the sheet or in a punched hole. • Never cross-over holes with the wheel, as this can cause damage to the wheel.